3 Little Zzz's for me: While the Cat's Away...The Mice Will Play! This week has been super fun and exciting- but unfortunately it ended with some sad news. My granddad passed away this week, so I had to fly out to Arizona for the funeral. Its was nice to see family I hadn't seen in years and meet family I hadn't really met before as well. It's just sad that it has to be for such sad reasons. I woke up early every day while in Arizona and went walking with my Aunt Darlene, Uncle Tom and cousin's to the Paradise Cafe. It was about a 3 mile-round trip walk from my Uncle Pat's house. It was such a nice way to start the day over there - even if I had to wake up early! Friday night we went for a hike in downtown Phoenix. 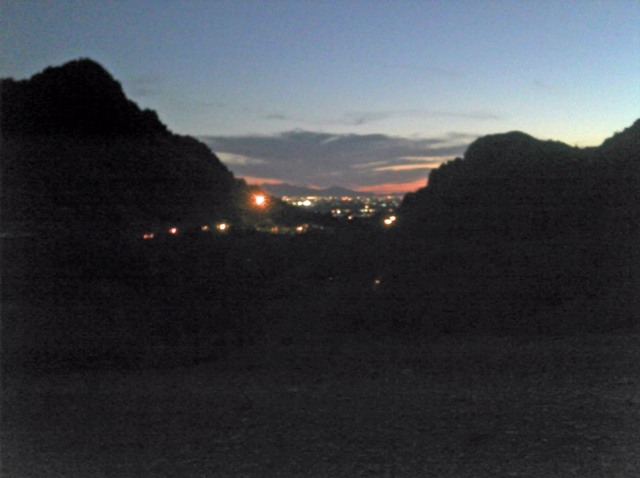 Phoenix is so large that you can go HIKING in the mountains the middle of the city. Crazy! Saturday night was my Granddad's funeral. Lots of really nice memories were shared, remembering what a neat guy my Granddad was. Here I am with my cousins and siblings after the funeral. My cousin Josh is a US Marine (so proud of him!) and he presented the flag during the funeral since my Granddad was a veteran. My mom (on the right) with her siblings and cousins. My cousin with my neice. While I was out in Arizona, Tom stayed home with our kids and got quite a bit of things done. I made him promise to take pictures for me...so he did his best! I left Thursday morning and Tom took the afternoon off to do some work around the house. Our pond has a leak in it, so we are going to have to do some repairs to it to stop the leak. Clint delivered some rock to repair the dam overflows once the leak has been fixed. So Tom and the kids had fun watching the rocks get moved off the road to an area closer to the pond. "Sweeping" the pile of rocks together. Friday, Tom and his folks got to digging fence posts and concrete pilons for the dock. They even convinced the neighbor to come help them dig the holes with his tractor and an auger we borrowed from another friend. It was super easy to get the post holes dug for the fence around the house. However, the holes for the concrete in the pond were not easy and wouldn't drill at all. So eventually they gave up that idea and planned on using Clint's machinery to dig bigger holes for the dock later. ...out popped our sewer tank! :( Thankfully all Clint and Gary's machines were still here, so they were able to get the sewage tank back down again and covered. Our house from the pond. The stairs are being formed. Top stairs are done and it's just the bottom steps that remain. Inside the house, the HVAC guys came back and connected a bit more of the ductwork together. The air intake for the basement. The craziness from the floors above join in here. Our safe room still leaks - hopefully we can get it fixed quickly! Our Mudroom bench has been installed! Our bathroom has been tiled now. Even the floor! Love it! Then Tom took the kids out to the pond to enjoy some downtime - catching tadpoles! Sunday, the grandparents and great-grandparents left to go back home, so Tom and the kids had fun just enjoying the beautiful weather. Our house is getting closer to finished! Our built-ins are looking good. The house is still a crazy mess though. Nikki nspecting Mommy and Daddy's shower. Tommy trying out the new shower floor - now that it has been grouted. Oops - someone forgot their phone! View of the great room from upstairs. Of course, so is Tommy's bed! The new road to our house. Our pond and the crazy HVAC contraption. The covered Sewage bed - can't drive on this dirt anymore! Having fun walking the stream bed. View of the valley from our hill. Kids having fun staying up late. One final shot of the kiddos before they went back inside to watch movies until it was time to come pick me up at the airport. I gave each of the kids a whistle and a hakky sack. Nikki was excited about her noisemaker - or maybe she was just too tired. It was about 11pm after all! I also got a couple of books on Arizona for the kids to enjoy. Tomorrow when everyone is awake, I'm sure we'll have lots of fun!